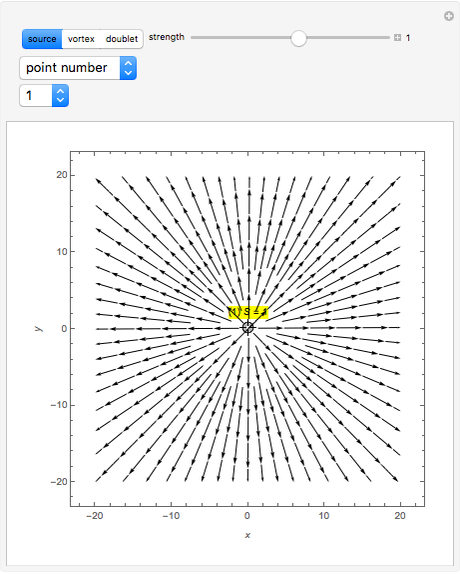 Initially there is one locator that represents source flow at the origin, labeled "(1) = 1". The first 1 is the current number of the locator. The symbol , , or is an abbreviation for source, vortex, or doublet, respectively. The last 1 is the value of the slider "strength". Positive and negative strengths appear with yellow and green backgrounds, respectively. To create a new elementary flow select one of the buttons "source", "vortex", or "doublet" and place a locator. Deleting a locator reorders the numbers and the "point number" becomes 0. 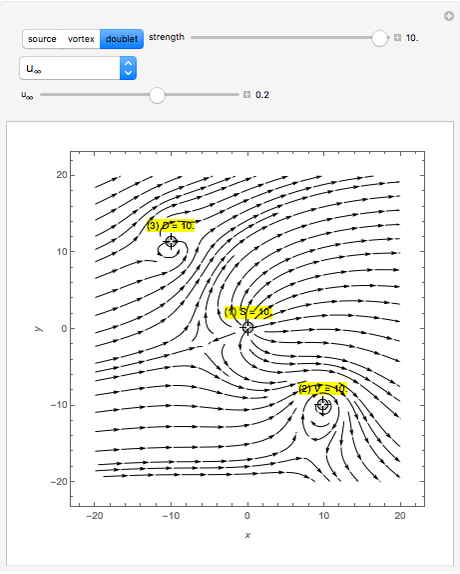 The stream functions for source, vortex, and doublet elementary flows are , , and , respectively, where is a measure of the strength of the flows. 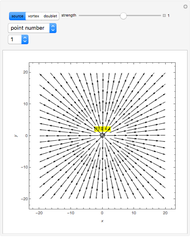 The velocities are obtained from and . Next and are replaced by and to obtain the velocity at with strength as follows. 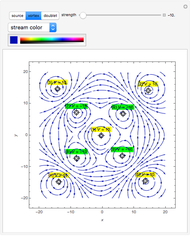 This uniform flow is equivalent to the flow with velocity in the direction . 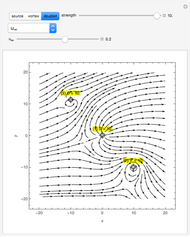 The velocity field stream lines are plotted by using superposition of the above velocities with strength located at the points . It is interesting to compare this Demonstration with the applet given in the related links. The results are similar but the vortex positive rotation here is clockwise, while there it is counterclockwise. 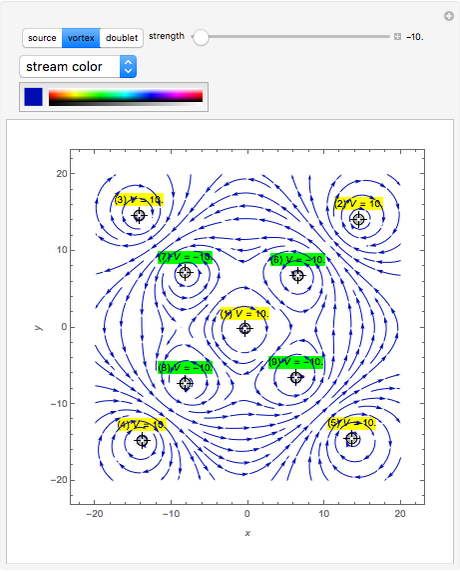 See the applet on the superposition of elementary flows. Mikhail Dimitrov Mikhailov "Velocity Stream Lines from Superposition of Elementary Fluid Flows"